From lasers to plasma, punch, warterjet and beyond, metal-processing equipment represents a significant investment for any job shop, fab shop, steel service center or manufacturer. Maximizing and accelerating the return on investment is critical, and it only makes sense to drive such advanced equipment with sophisticated software designed to leverage the machines’ capabilities. To this end, more fabricators are replacing basic software with more advanced nesting applications. Glenn Durham, vice president of engineering for SigmaTek, recently took time to share what fabricators need to know. Scrap reduction and accelerated cutting cycles are a few of the obvious benefits of nesting programs. Where else do nesting programs make a difference? Durham: Nesting not only is about scrap reduction. It also is about part placement for manufacturability. Companies such as ours want to help manufacturers reduce scrap by providing tools that make it easier and more efficient to track and reuse drops. There are situations in which optimization of the part’s location is required before considering material utilization. For example, vacuum-table routers have the strongest suction in the center of a sheet. Therefore, nesting must prioritize placement of the largest parts, which need less suction to remain stable during cutting. Nesting of larger parts occurs around the outside of the sheet and farthest from the center of the table. Nesting of smaller parts occurs toward the center of the sheet, where table suction is greater. Another example: nesting for machines that drag the sheet. In these nests, we must lay the largest parts down closest to the clamps and then cut parts farthest from the clamps. 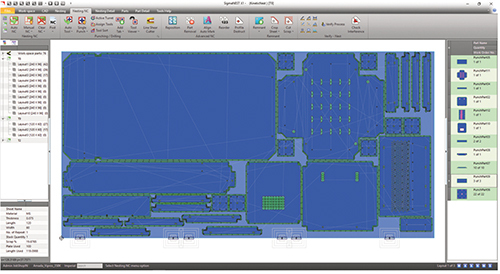 Design for manufacturability means understanding machine specifics to produce the best nest and apply a proper toolpath. Cutting machines generally come with a pre-installed nesting program. At what point should a fabricator consider upgrading to more advanced software? The basic software packages delivered with new cutting machines help most smaller shops get up and running quickly. However, when fabricators want to move beyond cutting a few parts and into managing business in the most profitable and efficient way, then it’s time to consider an advanced package. What should one look for in a sophisticated nesting program? The answer depends on the needs of the fabricator. We find that as newer and smaller shops grow, they first need to add the capability to import parts from a variety of CAD systems, nest those parts in a very efficient way and then machine them with an optimized tool-pathing algorithm. Advanced importing, nesting and NC usually are the basic requirements. Beyond that, most shops want to take projects from quote to delivery by managing inventory and work orders, controlling remnants, and reducing waste. Advanced systems able to accomplish all of this will quickly pay for themselves. Can you cite examples where nesting helped achieve significant ROI? We recently completed a project where our nesting improvements saved an entire sheet over a production run. That was due to an approximate 3-percent improvement in nesting efficiency. That may not sound like a lot, but since the fabricator had runs of more than 25 sheets, it reached the end of the job using one less sheet. This not only saved material, but also handling time, worker hours and machine wear, and improved machine uptime. ROI also results from situations where material utilization is not the main goal. For example, recently, a fabricator had more orders than it could cut and no room to add another machine. Therefore, it needed to reduce the time needed to cut each nest. Through a combination of nesting and motion optimization, advanced software helped the user reduce machine time by more than 10 percent for each job. Since it was running seven machines, 24 hr./day, the fabricator suddenly fulfilled production demand without purchasing additional machines or needing to add to its workweek. A 10-percent run-time improvement is significant. Is that the norm? Don’t always expect a 10-percent run-time improvement. Certainly, we want to cut more material faster, but more importantly, we seek a comprehensive solution that allows the business to maximize ROI based on a variety of factors. For example, a company that cuts 3 to 6-in.-thick stainless steel with its waterjet machine wanted to set up a run at the end of each day and let the machine process it overnight. To minimize the chance of tip-up for these types of lights-out tasks, the company uses a part-avoidance feature. While this safety feature adds a few minutes to the multi-hour run, it allows for the cutting of a plate every night, which ramps up ROI. What are the biggest nesting challenges fabricators face today? One approach for dealing with these challenges requires importing assemblies and creating multimachine process plans. Fabricators increasingly are concerned with more than drawing and cutting parts. They need a solution that also deals with the assembly of parts cut on various machines, including tube lasers, press brakes and plasma cutters. It then can unfold sheetmetal parts, task and nest for each different type of machine—all while managing the flow of different kinds of parts along the shop floor. Bevel cutting can be challenging. How can software address this? Bevel cutting involves complicated processes and careful thought, making it essential to understand the cutting machine first and then the bevel pathing before parts are nested. Bevel nesting must consider bevel pathing, which adds a layer of complexity. Software coming online applies a toolpath to bevel edges. That should be available in the coming months. SigmaTek, for example, uses collaborative methodology for software development, which includes input and ideas from software users. Case in point: When a part has a small hole in it, a fiber laser can cut out the material and drop it through the slats. However, we started receiving calls from customers wanting a way to automatically cut a larger drop (one too big to fall through the slats) into small pieces that would fall through. In response, we added a laser-destruct feature to do precisely that. Another example relates to tabbing parts into a sheet. Customers told us that they needed an automatic method for tabbing in parts that are small enough to fall through the slats of their machines while leaving tabs off of parts that would not fall through. Therefore, we created center-of-gravity tabbing to provide automatic tabbing of parts that do not have slats on both sides of the center of gravity. Where do you see the industry as a whole five years down the road? Information for this article was provided by SigmaTEK Systems, LLC, Cincinnati, OH; www.sigmanest.com.